Hey marketers, here is a great read I viewed yesterday from SocialMediaExaminer.com. With all of the buzz about how pervasive and necessary Social Media is today, this is a very interesting post about how effective blogs are today. It is quite clear from the research report highlighted below that blogs still carry a lot of weight even though they might not attract as many eyeballs as Social Media does. It is quite clear that blogs are a great way to build loyalty and trust, and should be a part of any businesses marketing strategy. Enjoy. Are you wondering how to influence potential customers and prospects? 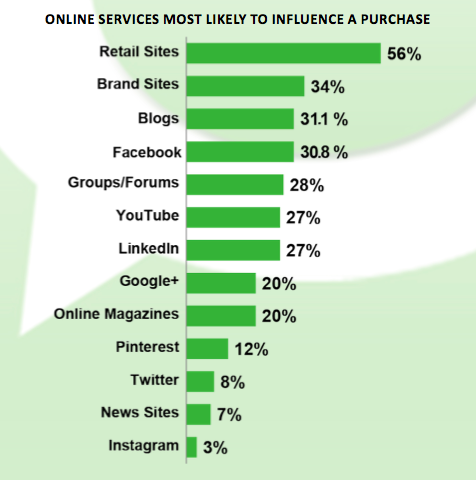 The latest findings from Technorati’s 2013 Digital Influence Report show that “consumers are turning to blogs when looking to make a purchase.” In fact, blogs rank favorably with consumers for trust, popularity and even influence. 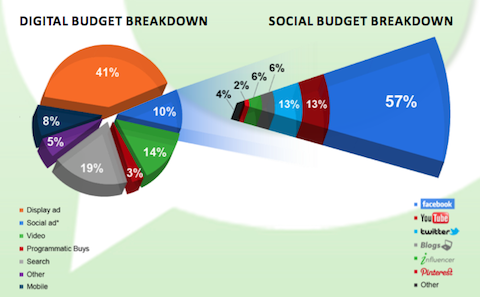 Here are some interesting findings from the Technorati report. The report found that blogs are now the third most influential digital resource (31%) when making overall purchases, behind retail sites (56%) and brand sites (34%). Consumers said that blogs rank higher than Twitter for shaping their opinions and higher than Facebook for motivating purchasing decisions. Why are blogs so influential? Bloggers tend to be very honest and sincere in their reviews of products and services. They talk about both negative and positive aspects of a brand, and in doing so become a trusted source of information. Trust drives action, and thus consumers look to bloggers before they buy. You may have heard that recently Robert Scoble (a very influential blogger in the tech industry) announced he was switching to Android because “Apple has slipped.” Robert has a ton of clout in the tech world, so it’ll be interesting to see how consumers (and techies in particular) respond to his moves. Over half of consumers surveyed agreed that smaller communities have greater influence on a topic than larger ones. The real value of online communities comes from discussing ideas, sharing information and learning from one another. Rarely does value come from the size of a community. 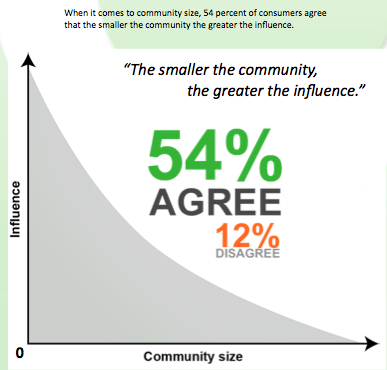 Most consumers agree that smaller communities have greater influence. Consumers understand this. But brands often get hung up on acquiring massive communities, sometimes at the expense of user experience. In fact, brand marketers often pursue popular A-list bloggers to advocate on their behalf, hoping this strategy will help a message go viral and explode the size of their community. The problem is that while a message blasted by a popular blogger might reach the masses, it doesn’t always produce the desired result. That’s because trust drives action, and popularity doesn’t necessarily translate into trust. It may even be more effective to pursue a less popular blogger who has earned the trust of and subsequent influence over his or her own small community. If you want to become more influential with your online community, focus on providing value, building strong relationships (with your followers and other trusted bloggers) and offering great content. Even though brands are devoting only 10% of their total digital marketing budgets to social media, Facebook is clearly the preferred platform, taking 57% of the slice. Facebook is where the world hangs out and brand marketers know how important it is to be successful on this platform. In fact, the report shows that when metrics from earned media goals for brands were ranked, Facebook likes were at the top. This means that brands aren’t just focusing on Facebook ads. They are also interested in seeing increased activity on their Facebook Pages so much that conversation and engagement strategies have become vital for consumer outreach. The key to influencing consumers on Facebook is sharing content that generates interaction (likes and comments) and draws in more fans. 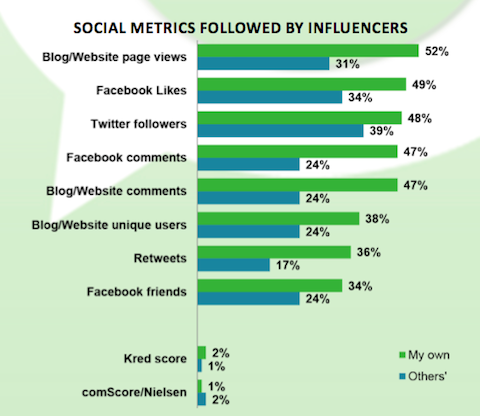 Influencers are more committed to blogs than other digital platforms. We’ve seen that trust is the currency of influence and that consumers are looking for “trusted digital friends” to give them advice on what to buy and where to go. That’s why bloggers who offer such advice are influential—because consumers trust their guidance. If you want to grow your influence, the key is to become a trusted source of information in your industry. Provide compelling content on your blog and then amplify it through social media. People will listen and you will become their go-to resource for specific advice. Influencers regard page views as the best measure of success. The reason why influencers focus so much on their blogs is because their priority is to deliver prospects to a site where that trust factor can begin to be tapped. For them, success is measured by the number of people reading their content. You too can build trust by publishing high-quality educational content on your blog and providing calls to action that lead people to a purchase opportunity. Brands are always looking for the “right people” to connect with on social media. They believe that effective influencer outreach can help spark valuable word-of-mouth campaigns that increase brand visibility and ultimately drive consumer action. Personally I doubt that I’ll reach for a Snickers bar every time I get hungry just because Aretha Franklin or Liza Minnelli are advocates for the brand. The problem is how brands define influence. The Technorati report says that brands are using comScore or Nielsen rankings to identify influencers, yet these metrics do not represent influencers very well. Meanwhile “real” influencers (those people whom consumers trust and rely upon for advice) are hanging out mostly on their own blogs creating tons of content. If you’re a brand marketer trying to connect with influencers, remember that having a large social media following doesn’t give you influence, it simply gives you an audience. Try looking for influencers who have very close ties to their communities, or bloggers who are relevant to your brand even if they don’t have worldwide fame. Some great places to look include Google+ Communities and Boardreader (a search engine for online forums and community boards). The biggest takeaway from the Technorati report is that blogging is a great way to cultivate community, share and discover insight and to build up your influence as well as authority. The key is to produce consistent content that is valuable to your community and to listen to the feedback your community offers. Responding to this feedback and getting to know your visitors is how relationships develop and this of course takes time. So have patience with the process and have faith in it. It works, but only if you work it as they say.